We have had some fun times of late with the arrival of our fabulous new WOOFER Alan 🙂 What an amazing enthusiastic kiter we have to help out this year. Alan came to us as a guest last year, his first time to an island kitesurfing destination in the South Pacific. He contacted us late last year and it was decided he would come to live with us for six months and help out. Alan has such motivation and enthusiasm for kitesurfing which is just beautiful to have around. Not only is he a mad kitesurfer but he can also build. This talented individual has built an incredible pizza oven for Fanifo Lofa. It is not only a lovely feature in our new outdoor area but it works a treat. The pizzas we now produce are second to none! We will be firing it up regularly for our up coming visitors this season. We have settled into the new outdoor seating area quite nicely. We have dinner out there most nights and the sail shades and outdoor lighting make the area very romantic. Outdoor dining at its finest here at Kitesurf Tonga. Experience South Pacific kitesurfing plus amazing home cooked meals…who could ask for more! Alan and Glen quickly got to work in the kitchen as we never got around to building an extension the common fale. They created all sorts of shelving and an amazing wall drying rack. No longer am i cluttered up on the kitchen benches…it is a lot more functional now 🙂 We will do the extension once it quietens down a bit. The NEW SHINY FABULOUS FRIDGE arrived a few weeks ago…Her name is Lady Gertrude. She stands so tall and has quite a girth on her. She holds all our perishable items and even makes ice in an hour! Just imagine that…no hunting through the chest fridge anymore to find the cabbage…or the milk or the…anything! its all available and easy on the eye 🙂 Welcome Lady Gertrude! Lady Gertrude was meant to arrive with a few new batteries…low and behold…they didn’t arrive! Where were they you might ask? Still in Nuku’alofa? no..they hadn’t even left New Zealand, much to our dismay. Oh well not to worry..our electrician aka Glen managed to get everything working with our old crappy batteries and things are moving smoothly. We have two new little additions to the Kitesurf Tonga family – Lucky and Jenga. Jenga is a small little black…wait…he is no longer small. He is about 4 months old now and is turning into a bruiser..cute as a button though. We acquired Jenga when he was about 5 weeks old on a Sunday in Pangai whilst we went on a booze cruise for Amecia’s farewell. What a day! Jenga was the centre of attention 🙂 Lucky came to us the next day after Glen rescued him from being kicked around like a football in town. He was so skinny and had hardly any hair. I am pleased to report that he is a cheeky happy monkey now. He is still skinny but growing quite tall. He and Jenga get along famously and are starting to cause havoc as puppies do. Alan now has company in the staff fale as our cook from Fiji, Joyce, arrived yesterday. WOOHOOOOOOOOO!!!!!!!!!! She is going to be a great asset to our team this year. She has lots of cooking experience and is sure to delight us all with cuisines from the South Pacific. I am very much looking forward to handing over the reigns in the kitchen to concentrate on washing sheets…lol wait that didn’t sound very exciting did it!? hahahahaha keeping sheets white in this environment is very hard work. Bleach is not really bleach here…its watered down. So you have to use about a bottle every time you do a wash. Once i get it out of the washing machine and take it to my awesome drying area the sheets are then available for the puppies to play with…there is nothing like a puppy rubbing itself on my clean wet white sheets.. GRRRRRRR! i have worked out that if i double them over the puppies cannot reach them..yet. Once the sheets are up and drying insects like to find their way onto the sheets…putting little marks and dots on them…and sometimes if i am really lucky the trees also drop things on them. So once i arrive back to the sheets for folding and collecting they need washing again. 🙂 hahahahahaha but i do enjoy it…really i do! The trials and tribulations of island life eh! My dad visited me for the first time this year and had a ball! We went fishing and on a drunken little Sunday sprawl to Craigs place one Sunday. It was very amusing to watch them stargaze after drinking a litre of bourbon and then stumble off to bed. Well done Dad and Alan 🙂 He is already planning another visit to us in October. Glens dad also came out to Tonga for a visit to see our place. It was his second visit to Tonga and I think he was proud of our achievements in that time between visits. We are very excited to see guests returning for the second visit to experience South Pacific Kitesurfing and also excited for all our new guests. We pride ourselves on being a dedicated kitesurfing resort and have that family feel when you arrive. 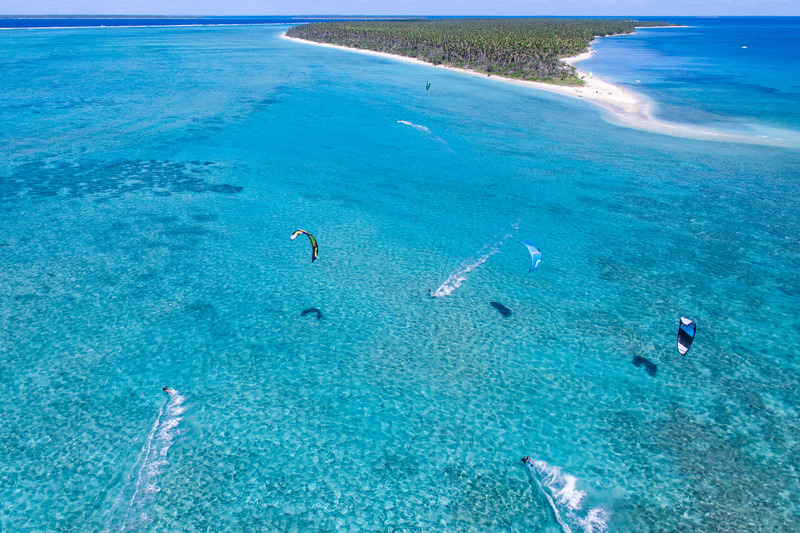 For those of you visiting us this year don’t forget to check our FAQ’s page of things to be aware of Kitesurf Tonga FAQ WE still have some vacancies so feel free to experience South Pacific Kitesurfing at its best. From April to November we have the tradewinds and the added bonus is the humpback whales coming through from July to October each year. I didn’t post the blog and our June guests turned up! Our lovely friends from Nelson arrived…well arriving was meant to be on the Friday..it ended up being on the Monday. Tonga had some unwanted weather on the Friday they arrived and then the domestic plane wouldn’t fly…understandable as we filled a few 200L drums with rain water…so much rain. It rained friday, saturday, sunday, monday…its now Tuesday and its still raining. The rain bought along some unwanted weather forecasts for this week too! It went from 25plus knots predicted to 11knts! However the boys and girls all bought along their big kites and they were taking turns on the 17m this morning and now the wind has picked up so they have gotten out! Yay! Lets hope that continues on 🙂 Anyway back to the point i was going to make when our group arrived…our fabulous friend Dave was here (as a surprise for my bday :)) and he was due to leave. We were sitting here waiting for glen to pick up the guests and bring them back…by 9am Glen called and asked Alan to bring the tender over to pangai. So off Dave and Alan went with the tender short cutting in low tide and barely making it in time for Daves flight…I was back at the ranch waiting for Glen to contact us to let us know what in hells bells was going on…I had no phone credit…so joyce text glen…no response…..finally at about 1pm (their flight landed at 7am) glen arrives driving someone else boat…At once i knew there must be something up with our engine…The rain flooded the carbs etc. Glen has been working on it for a couple of days but it doesn’t seem to be working properly. Anyway guests all here…then the water pump stops working… We need the water pump to provide water to the fales…so did a fix…and then some of the fales had no water even though the tanks were full…Turns out the double feeding pipe to the twin header tanks was too long and was actually sucking water back down through the pump…geez…okay fixed it…cut it…water issue fixed. We are all exhausted at this stage (i should mention we all had slight hangovers after my birthday celebrations) and then Glen shows me a letter from the Tongan Revenue department saying we owe them $6500 for our last tax return…They were basically saying that we never submitted one…After speaking to another fellow pahlongi i quickly realised they had lost all of haapais last years tax records…I mean really???? Only in Tonga can this happen…seriously!!!!!! just painful. Okay and then what happened…hmmmmmm….oh yeah it rained rather heavily again after dinner and one of the fales beds got soaked…anyway i quickly fixed it up and Glen and i were soaked to the bone. We chose to end the day and go to bed. So we wake up today…and there is no water AGAIN…Alan created a little measuring pole so we can see if the water from the tank was draining quickly/slowly…and we can only assume that everyone had at least a 50litre shower each lol 🙂 So then glen is off to try and fix the boat engine…spends all morning on it…and alas its still not fixed and the starter motor also broke. Oh did i forget to mention that we had Saia’s boat out on our mooring and the rain came down so much last night that it looked like it was drowning out there so i kayaked out and started bailing. Low and behold the kayak came loose and drifted away. I yelled to shore and Alan jumped on a SUP but wasn’t really gaining on it…I jumped in and swam the kayak paddle to him but saw glen on the beach dragging the tender into the water…so glen went and got the kayak .. note to self and others who keep losing kayaks namely Glen and myself…STOP tying crap knots!!! lol Anyway Glen has gone to pangai now with Saia’s boat in the hope of getting our big boat in the water. Don’t even ask about that one. So it seems that we are off to an exciting start to our season hahahahahaha 🙂 Only in Tonga! P.S Come and visit us for an awesome South Pacific kitesurfing destination – Kitesurf Tonga.